In 2016, we realized there was a need in the industry for an easy way to piece together merchandising themes in a redemption display. Not only is it difficult and time-consuming to put together an item assortment, but figuring out how to place everything on the wall in a way that makes sense is its own challenge. 1 | Storyboards minimize assortment planning and cost of goods sold. Each storyboard includes the right amount of core and supplemental items to drive the optimal cost of goods sold percentage. We are constantly analyzing each item’s performance to ensure your center is stocked with the best. The distribution and velocity of each item are tracked and vetted. 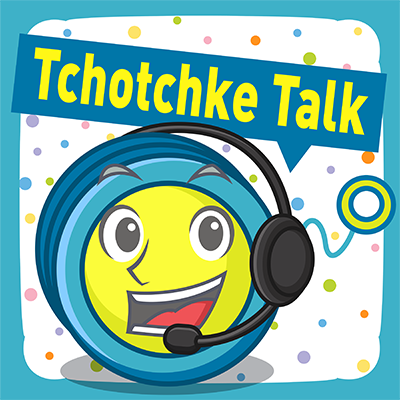 As items are discontinued from our line due to poor performance metrics they are replaced in their Storyboards. It’s easier to control your COGs when you know you have items in your display that are proven to perform well (items in our core) and items that drive additional guest spend (supplemental items such as flash and licensed items). Building your display by storyboards help you follow the 80/20 rule of keeping mostly data-proven items while mixing in new, licensed, and flash/trendy prizes. 2| Storyboards minimize merchandising time. With multiple square-foot options for each Storyboard theme, such as Action Gear, they can be easily implemented alongside your own merchandising plans. For example, if you have a section dedicated to markdowns and a section dedicated to your custom prizes, Storyboards can easily be plugged in anywhere next to those sections. 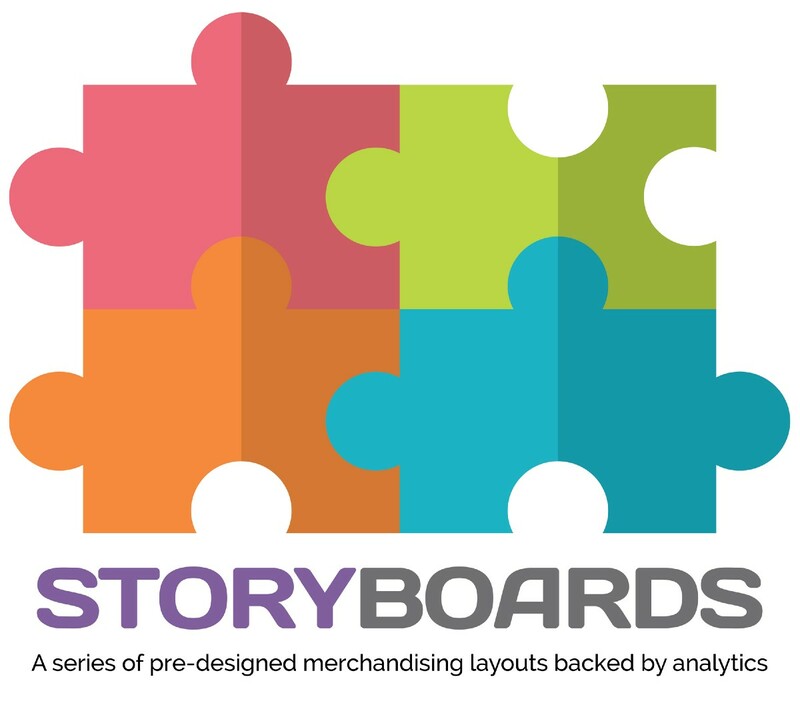 Storyboards themselves are a map of where the products go on your display wall. This makes it easy for new and tenured employees alike to know where each prize goes. That way they’re not trying to space things out properly or piece together a display puzzle on their own. 3 | Storyboards create easy shopping experiences for your guests. Humans naturally process information in categories. We need a way to efficiently narrow down all grocery store items to just the one type of thing we’re looking for. This same browsing technique applies to how your guests shop through your redemption area. The Psychology Dictionary defines categorization as: The process of grouping or classifying people, objects, events, and experiences. Usually, these are grouped according to classes based on (1) common characteristics which members share in a class and (2) distinct features which distinguish these members from those of other classes. 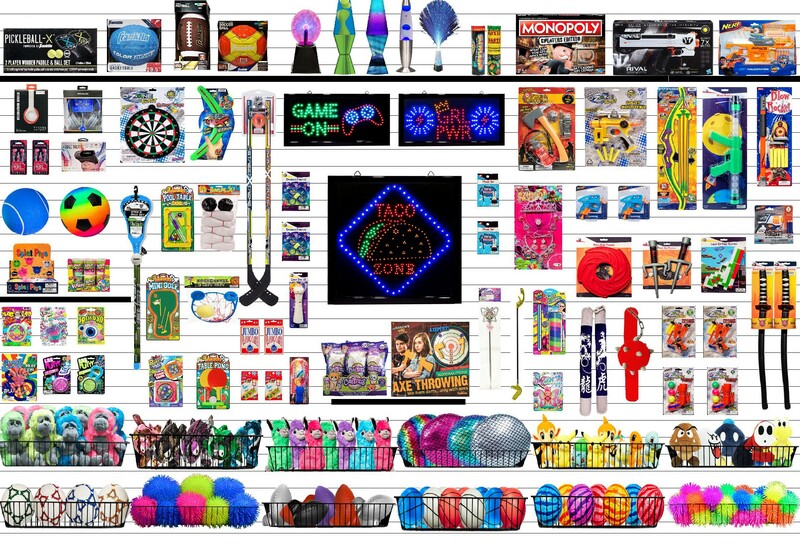 By including categories in your redemption display, you create a more enjoyable shopping experience, increase the likelihood of more revenue and save yourself time in your ordering and merchandising processes. Our answer to this categorization need? Storyboards. All Storyboards will be updated by the end of February (pending no delivery delays). The updates include new items that have come into our line recently to give each board a fresh look for your space. One of the Storyboards that have received the biggest overhaul is Light It Up. Our lighting theme has been stale for quite some time. We’ve given it new life with updated LED signs and some trendy string light prizes. There are also new takes on the traditional Lava Lamp — like the Northern Lights lamp you can see below. We also didn’t forget about providing you with new items in a lower-ticket range. An added perk of this Storyboard is that the lights draw attention to your redemption area! Be sure to display examples out of their boxes and light them up if possible. We suggest updating your Storyboards one at a time as to not throw off your inventory and purchasing budget. Let one board sell down to its bones, save what’s left for a manage-out section, then order the new board to replace it. These updates are the first of two our Storyboards will undergo this year. As we analyze our entire line twice a year — adding new items, discontinuing poor performers — Storyboards then need to be updated to reflect those changes. Our next refresh period will begin in July. If you have questions about how Storyboards are updated, or how to manage the changes in your redemption center, please reach out to your account manager!